Details of the staircase at 'Poplar Hill', the Frederic B. Pratt estate designed by Charles Platt between 1917 and 1924 in Glen Cove. Click HERE for more on 'Poplar Hill' and HERE to see the brochure from when the estate was for sale. Image from The Architect, 1929. Poplar Hill is my favorite of the Pratt houses, although a tad boring. 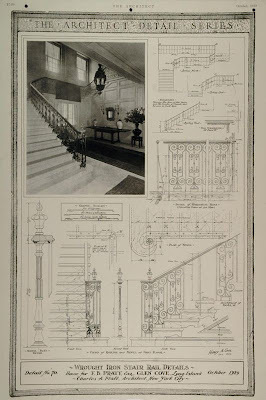 While the Pratt brothers were certainly prolific in their architectural commissions,none of them appear to have been praticulalrly stylish or cutting edge in their tastes, opting instead for solid, stolid opulence. This interior shot seems to confirm that Frederic Pratt's inclinations matched his brothers in that regard. Restrained, yes, but very handsome. On the second, look at two of the pictures in the flash display. Ancient- your thought runs through the mind of every local resident. As I've posted before, many Glen Cove locals ascribe our terrible cell service to nefarious communications by the Ruskies, and the CIA's attempts to intercept/monitor or jam the information flow to the motherland. Is that an added on wing, or is this the original construction? Off subject...any info on "Sunnyside" on Bayville Road, Lattingtown?